Going Private: Tougher than Going Public? Yes, says a CFO who has done both. Computer-maker Dell may be in for a walk on the private side, but a wild ride is in store for the finance team no matter which buyout bid shareholders select. At the time of this writing, with Dell Inc. embroiled in a high-stakes tug-of-war over ownership of the company and the situation changing daily (and even hourly – a shareholder vote scheduled for this morning was abruptly postponed until July 24), I’m thinking of the challenges in store for Dell CFO Brian Gladden ­– or, perhaps, another finance chief. Should chairman and CEO Michael Dell succeed in convincing shareholders to accept his leveraged buyout offer, Gladden presumably would stick around to direct the company’s privatization. Should Carl Icahn prevail in his hostile takeover bid, which envisions part of the company staying public and part going private, who knows? Icahn says he has a specific new chief executive in mind, and it’s common for a new CFO to come along relatively quickly following a top-leadership shift. Whoever runs finance at Dell will have his or her hands full, for multiple reasons, not the least of which is the need to fight off a market perception that the company’s product lineup is on the tired side. But the mere logistics of going private can be brain-rattling. At least so says Ned Sizer, the new finance chief at Hightail (until last week known as YouSendIt), a $57 million provider of online file-sharing services. Sizer, until recently the vice president of financial planning and analysis, analytics and business intelligence at Ancestry.com, played a big role in taking that company private late last year. To be sure, that was a much different kind of deal than either of those the Dell shareholders have to choose from. Still, from Sizer’s perspective, it was far more complex than, say, taking a company public, which is famously regarded as a rigorous, exhausting exercise. He has some wherewithal to compare, as he headed FP&A at web-analytics firm Omniture (since purchased by Adobe Systems) when it went public in 2006. 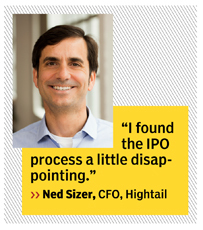 Yes, an IPO involves a lot of work, concedes Sizer, now in his first CFO job. You have to select bankers, prepare and execute a road show for investors and analysts, develop an accurate forecasting process and prepare the S-1 registration form, which means making your financial reporting compliant and articulating a definitive list of risk factors. Along with the deal, Sizer got his taste of challenge. When going public, there is one board to deal with and one process. When going private, there may any number of private-equity suitors, some of which may be consortiums of P.E. firms. The finance team at Ancestry.com had to make “more than five” pitches, and it got “a litany” of follow-up questions and requests for analyses. In Dell’s case the challenges involved in taking the company (or at least part of it) private will be quite different. For one thing, there are just two competing buyout offers, one of them hostile. Still, there won’t be much rest for the finance department if Icahn wins (and that’s the way the wind is currently blowing), as the billionaire takeover savant is hardly a hands-off owner. Or even if he doesn’t. With revenue of $57 billion in its most recent fiscal year (ended Feb. 1), the computer giant is about 100 times the size of Ancestry.com. But as complicated as recasting a company that size as a private concern may prove, it’s not likely to be nearly as tricky as executing a subsequent turnaround of Dell’s fortunes. That $57 billion was 8.3 percent less than the company generated in its previous fiscal year, and half of its business remains in the shrinking personal computer market.